At the same level of BMI, white people have less visceral adipose tissue (VAT) and are less susceptible to developing type 2 diabetes than Japanese people. No previous population-based studies have compared insulin resistance and insulin secretion between these two races in a standardised manner that accounts for VAT. We compared HOMA-IR, HOMA of beta cell function (HOMA-β%) and disposition index (DI) in US white men and Japanese men in Japan. We conducted a population-based, cross-sectional study, comprising 298 white men and 294 Japanese men aged 40–49 years without diabetes. Insulin, glucose, VAT and other measurements were performed at the University of Pittsburgh. We used ANCOVA to compare geometric means of HOMA-IR, HOMA-β% and DI, adjusting for VAT and other covariates. White men had higher HOMA-IR, HOMA-β% and DI than Japanese men, and the difference remained significant (p < 0.01) after adjusting for VAT (geometric mean [95% CI]): 3.1 (2.9, 3.2) vs 2.5 (2.4, 2.6), 130.8 (124.6, 137.3) vs 86.7 (82.5, 91.0), and 42.4 (41.0, 44.0) vs 34.8 (33.6, 36.0), respectively. 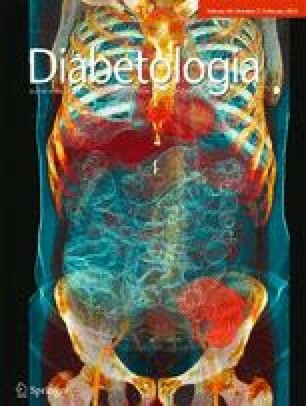 Moreover, HOMA-IR, HOMA-β% and DI were significantly higher in white men even after further adjustment for BMI, impaired fasting glucose and other risk factors. The higher VAT-adjusted DI in white men than Japanese men may partly explain lower susceptibility of white people than Japanese people to developing type 2 diabetes. The results, however, should be interpreted with caution because the assessment of insulin indices was made using fasting samples and adjustment was not made for baseline glucose tolerance. Further studies using formal methods to evaluate insulin indices are warranted. The online version of this article (doi: 10.1007/s00125-014-3414-6) contains peer-reviewed but unedited supplementary material, which is available to authorised users. This research was funded by the National Institute of Health (RO1 HL68200) and from the Japanese Ministry of Education, Culture, Sports, Science and Technology (B16790335 and A13307016). VA, TK, RWE, AKad, TO, AF, EJMB-M, TH, AV, KM, HM, AKash, LHK, HU, AE-S and AS contributed to conception and design. TK, TO, EJMB-M, HM, AKash, HU and AE-S collected the data. VA, SREK and AS analysed and interpreted the data. VA drafted the article. All authors critically revised the article for intellectual content. All authors approved the final version. VA and AS are guarantors of this work.